John and I like a midnight screening and this time was no exception with the screening of ‘Spider-Man: Homecoming’ here in Belfast on 4th July. I have seen it for a 2nd time since and I thought I needed to do that before going ahead with this review. To be honest, the 2nd viewing didn’t make it any better or worse for me. The action sequences still caught my eye, but I didn’t see anything I didn’t see the 1st time, and the negatives for me were still there. As you can see from the score we enjoyed it, but there were things that didn’t sit well for us from a film perspective. I’ve tried to not reveal the big spoilers so everyone can read it, but be warned as I do go into detail on some things. Micheal Keaton – For me, Michael Keaton was the best thing about the movie. I was not keen on the characters quick setup with the time jump to suddenly become the Vulture, but his menacing and self-justifying behaviour throughout offset that. I think the fact that he brought a humanity to the role helped the audience connect with him more. I suppose that is the nature with most of the Spider-Man villains falling into the ‘redeemed’ category – The Lizard (Dr Curt Connors), Doc Ock (Otto Octavius) etc. – no matter how much of a threat they are Spider-Man always shows his humanity in the face of villainy and sees them as redeemable. That is evident yet again in this film. Tom Holland – Even thought I was not a fan of this version of Spider-Man I really liked Holland in the role. He was able to put his own stamp on the character due to the abundance of enthusiasm and energy that he brought to the screen. The film as a whole – There are a few things that I didn’t like about the film but overall I liked the energy, excitement, and new type of villain it has brought to the MCU. Vulture’s back story – As I stated above, I thought the Vulture’s back story was lacking and I would have liked more time devoted to it. I know there were hints dropped at the start to suggest why he started a life of crime and what the wings were made out of, but I wanted to see more of what drove him to become the Vulture. I wanted that stronger connection to sympathize with him more. I believe the character had more to give in that respect. Movie Spider-Man 3.0 – This could be a generational thing as I grew up with the Spider-Man animated series in the 90s, but I am not a fan of this younger version. To me it makes more sense for Peter Parker to be nearing the end of his teenage years given the responsibilities he has by becoming Spider-Man. I think it is more believable for an older Peter to take that leap into heroism. But I would still keep the Stark storyline with recruiting Peter and going through all that he has to in the film to become better. Iron Man marketing – Over the past couple of years I’ve started to notice that studios are using high profile actors from the film to promote it portraying their character in a different light than what actually happens in the film. Bryan Cranston comes to mind straight away for ‘Godzilla’. He was used heavily in the marketing of the film but he meets his demise within the first 30 mins of the film. This is the case for ‘Homecoming’ as well as RDJ was used heavily in the marketing and Iron Man can be seen in all the trailers, but his role was at best an extended cameo. I’m sick of studios falsely promoting their films in order to garner a wider audience. It will always been seen as a negative in my eyes when reviewing a film. Iron Man saving the day – As we all know from the trailers Iron Man saves the day at least once and as you will see in the film it doesn’t stop at 1. 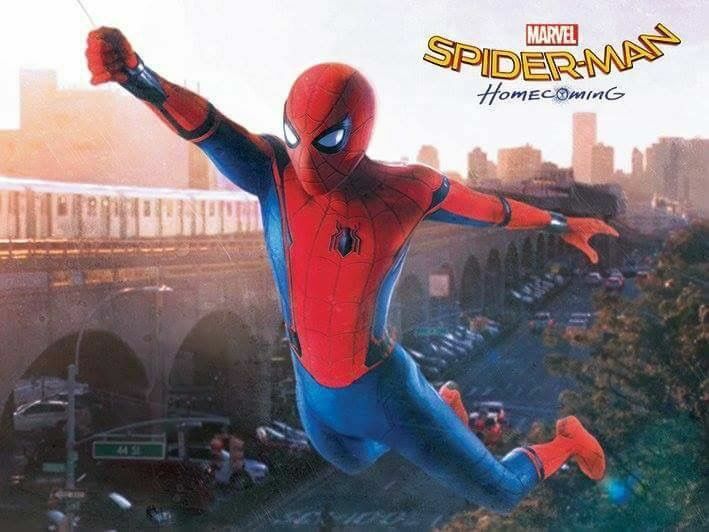 Peter is only 15 years old in the film which means he needs guidance on certain things, but he needs to learn from his failures through him failing so he can become the hero that he needs to be. I’m not suggesting that there needs to be death’s for that to happen but Iron Man rushing in to save the day all the time hinders his development. All this culminated in me never really feeling that Peter was in danger, except for the scene where the building collapsed and he was all alone. This also had a negative impact on the ferry scene, which was a homage to Sam Raimi’s ‘Spider-Man 2′. It was built as a significant scene in the trailers, but due to the inevitable rescue from Iron Man he never really got tested. Peter Parker flashbacks – I feel that the film needed to show some flashbacks of how he changed. I know nobody wanted another origin story, but due to this Peter Parker being younger that both of his movie predecessors it would have been beneficial to get a glimpse of how the bite etc. happened. Skilled hackers – The nonchalant hacking of the suit by sophomores was like watching an episode of ‘Arrow’. We get a glimpse of the scientific genius of Peter but the way Peter and Ned were able to locate and detach the tracking device as well as access hidden programs within the suit was a bit too casual for my liking given the documented genius of Stark and his high tech lifestyle. MJ twist – At this stage I know I’m being pernickety but was anyone happy with the MJ reveal? I can see how they are taking a different approach to the Spider-Man franchise with bringing in new characters and ethnicities, but the MJ reveal felt forced as it didn’t make sense based on how the character has been portrayed previously. Mary Jane is a staple character in the Spider-Man history so it’s not something that you can completely change. If you are planning on having a reveal like that then call the character a nickname throughout (obviously not MJ), not a first name. It then makes more sense for the character to point out that her real name is Mary Jane. Thanks for reading. I know, I need to work on my positives because I’m sure it looks like I am negative by default, which isn’t the case.